Getting a new bed isn’t just about buying new furniture. It’s an investment in your health. Poor sleep quality is associated with many issues. It can affect stress levels and even increase your risk for diabetes. It makes sense to do the research to find the perfect bed size for your room. Most likely you’ll have other things in your bedroom besides a bed. The other furniture will influence your decision about the right size to get. Remember, you’ll need adequate clearance around everything in the room for the ideal floor plan. Measure the length and width of your bedroom. Be sure to include permanent features such as a radiator, cupboards or window sills. And don’t forget to include the clearance you’ll need around any of them. Leave room for doors and drawers to open fully. Next, consider the placement of your bed. One of the best places to put your bed is at the centre of the longest wall. You’ll have enough room to walk around with feeling cramped. But, of course, there are other things to consider. There’s your chest of drawers and bedside tables too. Generally, a 3:1 ratio of total area to bed is a good starting point for adequate space. We could also use the interior designers’ ratio to put the size in perspective. That is a ratio of 60:30:10 for colour in a room. We’ll use it for furniture. That means 60 percent of the space for furniture, 30 percent for walking area, and the remaining 10 percent for whatever else you have in your bedroom. Now that you have some numbers to work with, let’s look at other factors. The space you have around your bed will make the difference between a good and a bad choice. You should plan on a minimum of 75cm of clearance around all open sides around the bed. Keep this figure in mind when you decide where to place it too. Of course, if you have it up against a wall, it might not be as much of an issue. For a more open feel for your bedroom, have 90cm around the sides. You should also consider other furniture you may add to the room. 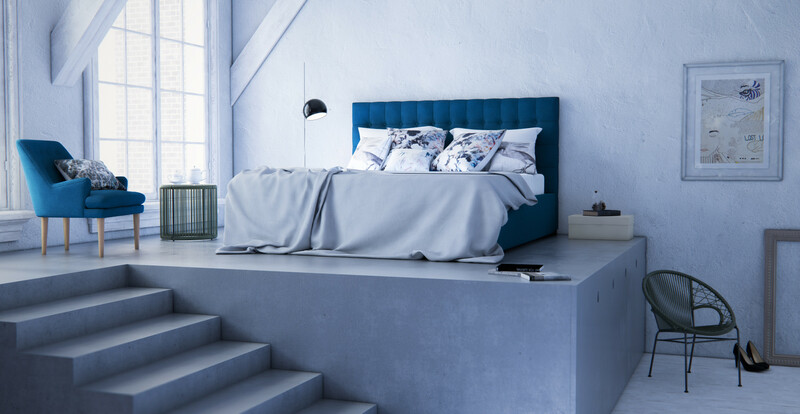 Take into account any added space from a bench or blanket chest at the end of your bed. And don’t forget the room you’ll need to open drawers especially if you place your bed next to other furniture. You may find it helpful to draw out your floor plan on paper first. Take into account all of the pieces in the room with the necessary space around them. Think about what’s most comfortable for you. Do you like to snuggle up close to your partner? Then, a double or queen would be good choices for you. Or would you rather sprawl out? You’re better off looking at a king size bed so that you both can sleep well. When considering these options, also mind if you’re a light or deep sleeper. Do you awaken easily if your partner wakes up during the night? You might want to opt for a larger bed. If you don’t have the extra space, there are other choices. A foam mattress will keep you from being disturbed. Buying a bed is a serious investment. And it’s a purchase you won’t make often. Go for a high-quality item. Think about it. You spend more time in your bedroom than any other room in your home. The trick is to balance your budget with the size and type of bed you buy. If you’re debating between two sizes, consider the smaller size. The price difference between a queen and a king size bed are significant. Don’t forget you’ll still need a base, frame or bed head too. You might find it’s a wiser plan to put the extra money into quality rather than a larger size. Also, think about you where you are now and what the future may bring. If you’re riding solo now, there may be a partner to consider down the road. Even if your situation changes, the size of your room won’t. Bear in mind that these are mattresses sizes. A frame or base will add several centimetres on all sizes. That will affect the amount of clearance you’ll have around the bed. Generally, queen or king size beds are excellent choices for couples. You’ll each have plenty of space to move around without disturbing one another. You should also consider the height of the bed. Opt for one that is easy for all occupants to use. Don’t forget to take other structures into account such as window sills. Remember, a taller bed can add extra storage space underneath. It’s a great option for smaller rooms to optimise your purchase. Your choice of style can affect your bed and frame purchase. Some such as classic traditional often include larger, more ornate pieces. Others such as contemporary or modern styles are minimalist. They may not take up as much space. Keep your decor in mind with other furniture you’ll have in the room too. You can optimise your purchase by choosing a bed that does double-duty. A gas lift bed frame, for example, will give you much-needed storage space. It won’t impinge on the area of your room. You can also opt for a base with drawers. Hidden storage is convenient and can help you free up space. Take into account the extra clearance you’ll need for opening the drawers. While they may cost more, you should balance it with the cost of getting another piece of furniture. You may find it’s a sound investment in the long run.